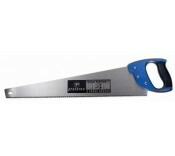 Well balanced saw with a solid blade for a fast and efficient cross rip cutting in medium thick w..
Hardened teeth for maximum performance Adjustable angled blade Ideal for cutting in awkward p.. Length 500mm / 20" - 7TPI Aggressive hardpoint teeth for precise cuts Forward and reverse cut.. Length 550mm / 20" - 7TPI Aggressive hardpoint teeth for precise cuts Forward and reverse cut.. Cast aluminium & mild steel frames Complete with metal cutting blade Dual cutting positio..
600mm Bow Saw Has a hard-point steel blade and a powder-coated, heavy gauge, oval section ..
750mm Bow Saw Hard-point lightening steel blade Lever adjusting oval section stee..